“Within hours of Liverpool’s Dream finale, we were being asking if a book would be produced so people could re-live the incredible spectacle they had experienced. 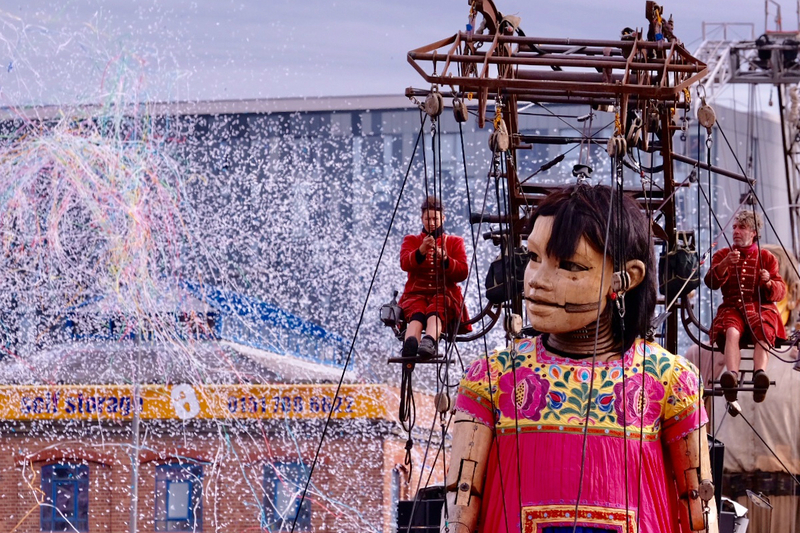 “The Giant’s visit to New Brighton was an unforgettable day and many of the 80,000 visitors who came to welcome him to Wirral will have taken stunning photos of his adventure. A truly magical experience which brought people together in friendship and fun. Something that will stay in hearts and minds forever. After missing the giants the last two times they were in my home City of Liverpool I was determined not to miss them again. So I booked a ferry across from Ireland and brought my 8 year old daughter to the final farewell parade where my eldest daughter caught a train from Manchester uni to join us and we met my sister and brother in law from the Wirral. It was such an amazing sight to behold, it not only brought the giants to life but it also brought the city to life. At a time where life is hard for many this event was for the many to enjoy and not just the few. It brought families and friends together and created many happy memories. A huge thank you to everyone involved. What a special weekend. Myself and my daughter came up from wolverhampton by train to witness the giant spectacle, i have no words to describe how magical it was to see these huge creations actually moving , life like, the music, the athmosphere all was a truely amazing experience, my daughter said it was the best weekend of her life, i cant wait to purchase the book. Well what can i say!! This was the most amazing weekend ive ever seen in my 67 years. We booked a hotel on the strand Fri till Sunday,by the Albert Dock. Not knowing this was the place to be everyday to see This spectscular display. We followed The Giants around the city. Also taking in so many of the beautiful buildings ive never seen before. Walked with the hundreds of thousands of people also following The Giants and the whole of Liverpool came together as a massive Happy Family, children, people old and young. Disabled. People from every part of the world. People were so friendly and helpful to each other. This was a very happy weekend. WELL DONE to everyone who took part to organise this fabulas massive event. And a great Thank you to The Giants and all of there huge hard working Family for making this all possible. May I ask why they are no longer performing? Hi Susan, these particular Giants have returned to the wall of planck in the sky, their original home from which they came to visit us and cities around the world. It was deemed that this is the end of their particular story but Royal de Luxe are working on a range of other stories with other Giant guests for the future and their journeys around the world.